Localisation of PFC0126c during the IDC. Localisation of the tagged protein was visualised using anti-HA antibodies (red). Antibodies against GAPDH were used to visualise the cytosolic compartment. DAPI was used to visualise the nucleus. DIC images are shown as reference. The protein is localized to a cytoplasmic structure distinct from the cytosolic and ER compartments, which likely represents the mitochondrion.Oehring SC, Woodcroft BJ, Moes S, Wetzel J, Dietz O, Pulfer A, Dekiwadia C, Maeser P, Flueck C, Witmer K, Brancucci NM, Niederwieser I, Jenoe P, Ralph SA, Voss TS. 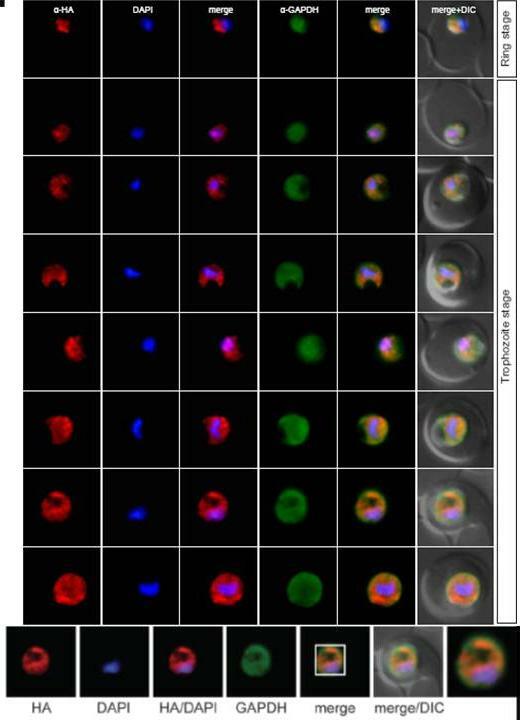 Organellar proteomics reveals hundreds of novel nuclear proteins in the malaria parasite Plasmodium falciparum. Genome Biol. 2012 Nov 26;13(11):R108.